Click on image to enlarge - plants are arranged like clock. Click on numbers below for detail image. At the end of winter it is easy to think that there is very little in the way of edible plants to be found. 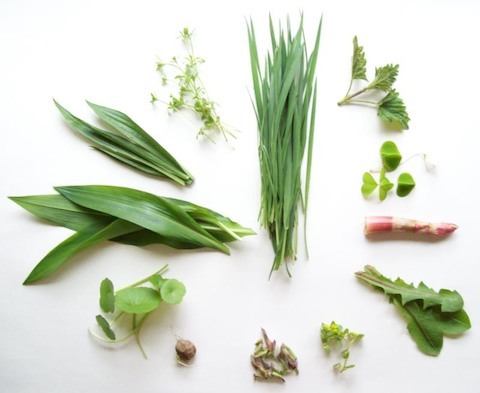 If you live in a temperate climate you can, in fact, find a lot of wild greens, some shoots, buds and roots. The above photo shows a selection of plants I found on the 24th of March in Wales, all of which are edible or have edible parts. There are, of course, many more. Alternatively, finding a plant, e.g. Opposite Leaved Golden Saxifrage, we can check the plant list and see that the leaves are edible (the green rectangle), and that they can be eaten raw (the "r" in brackets is short for "raw"). There are many more plants, or their parts, which can be harvested in March, so this is only a small selection. - Stinging Nettle Urtica dioica - pick tops before flowering and cook to destroy the irritant formic acid. Similar to spinach. Highly nutritious, and said to be a blood purifier. Great as a spring tonic. - Wood-sorrel Oxalis acetosella - a tangy, delicious green containing Vitamin C. The flowers can also be eaten. Contains also oxalic acid, which can aggravate kidney stones, arthritis, osteoporosis, asthma or hyperacidity, and should be eaten in moderation or avoided by those suffering from aforementioned conditions. - Japanese Knotweed Fallopia japonica - the shoots of this very invasive weed can be eaten like rhubarb, and also contain Vitamin C, as well as resveratrol, a substance being researched for its reputed cancer fighting property, and for heart health. Alas, it has a sting in its tail - this plant also contains high levels of oxalic acid (see Wood-sorrel, above). best eaten cooked and in moderation. Due to its high acid content, the plant can be used to clean stained sauce pans. For the same reason, it should not be cooked in aluminium pans. - Dandelion Taraxacum officinale - a powerhouse of goodness, in the kitchen, as well as the herbal chest. Apart from the flower stems which contain an irritant white latex sap (used to treat warts) the whole plant can be eaten. The youngest leaves are the least bitter. Can be eaten in salads or as a vegetable. The roots can be eaten as a vegetable or roasted for a hot beverage, similar to coffee. Dandelions are reputed to aid the kidneys and liver, and are great as a spring tonic. - Opposite-leaved Golden Saxifrage Chrysosplenium oppositfolium - a green available all year round in damp, shady places. The leaves, including stem and flowers, are edible raw or cooked. - Bramble Rubus fruticosus - this time of year the buds can be eaten before the leaves develop thorns. The flavor is rather unexpected - somewhat like coconut. The leaves are reputed to have many benefits, including depurative - ideal as a spring tonic. Can be eaten raw in salads, added to sweet dishes, or just nibbled. - Pignut Conopodium majus - the root of this plant tastes similar to carrot, to which it is related. Many foraging books say the flavor is nutty, but this is probably psychological, as the root looks more like a nut, and because of the name. However, if you close your eyes, the texture and flavor will seem more like carrot, a very juicy, tender young one. Pignuts should only be harvested where they are plentiful, and only in moderation. Each plant has only one tuber, and harvesting this tuber effectively destroys the plant. This applies to all edible roots from wild plants. - Navelwort, also known as Pennywort Umbilicus rupestris - these fleshy leaves are at their best in winter. Young leaves taste like lettuce, but become rather bitter when they get older. Navelwort only grows in the south-west of England and Wales, possibly other western parts of Europe. It grows on banks, walls and the base of large trees, and prefers acid condition, as well as damp. Can be found in shade. - Ramson, also known as Wild Garlic Allium ursinum - if you like onion flavour, you'll love this one. Although a little hot, it is mild enough to nibble on the go. The stems are slightly sweet and juicy, with a distinct onion flavor, and a mild garlic smell. Oh, if only it was available all year round. Alas, it only grows in spring. If you have a very large patch, it is worth drying some leaves for storage. The leaves will also keep a few days if the stems are kept in a bit of water (like flowers). The whole plant can be eaten, but the leaves are the main part to forage for. It is best to leave the bulbs in the ground to allow a plant to spring up again the following year. The flowers are also best left to drop their seeds. Oh, and this plant has all the benefits of cultivated garlic - high in vitamins, minerals, a blood cleanser and cholesterol reducer amongst other things (allegedly). Popping one of those leaves in your mouth, you can feel the goodness it oozes. - Ribwort Plantain Plantago lanciolata - closely related to the more round-leaved Plantain. Yet another blood purifier (allegedly). As a vegetable it is best eaten when young and tender, but don't expect it to be tasty, unless you like it bitter. For a less chewy experience, remove the ribs. Later in the year the flowers can be used as a gut scouring agent, in the same way that psylium is used. To use the plant for ointments, it is best to pick leaves in late summer. At any time of year the crushed leaf can be used to soothe insect bites and stings and nettle stings. It also aids the healing of wounds because of its antiseptic and astringent properties. - Cleavers, or Goosegrass Galium aparine - nature seems to produce a lot of plants in spring which are reputed to be blood cleansing, very useful after a stodgy winter diet. Cleavers is another one of those depuratives, and has a number of other benefits. The leaves, including stems are best eaten young and before flowering. Cook to destroy the irritant barbs. This plant can be confused with Sweet Woodruff, to which it is related. However, Cleavers has distinct minute barbs, which make it stick on clothes, and give it a rough feel. Woodruff is a more tender and shorter plant, and smells of fresh mown hay. - Grass - the stuff from your lawn or a meadow. Here I am talking about the leaves. Most lawn or hay grasses can be consumed after processing. The exception is any grass with a distinct sweet smell of hay, which is due to coumarin, a blood thinning agent. Although beneficial in small quantities, coumarin should be avoided by anyone on blood thinning drugs, with bleeding conditions or liver problems, and by pregnant women. Grass should also come from areas not polluted by animal waste, foot traffic or pesticides. Unfortunately we cannot digest the cellulose of the grass to get at its goodness, so we have to extract the juice with a special juicer, sold as a wheat grass juicer. Wheat grass, is just another type of grass, though one with greater reputed benefits. All grasses are very high in protein. This protein can also be extracted from the juice by heating it, which causes curdling of the protein. These fine curds can be filtered from the liquid and either eaten as they are, or pressed into a tofu-like curd. The juice, of course, is also very high in chlorophyll. The above plant images are not for identifying purposes. It is important to use a good guide, unless you are familiar with these plants. The post is only an introduction to the plants mentioned therein, and should not be relied upon in isolation. The foraging guide mentioned above was carefully researched, erring on the conservative side, however, it is important to read it together with any caution notes, and ultimately responsibility for your safety lies with you. The image of the details from the calendar and plant list are from the Handy Foraging Guide and Hedgerow Herbal available as a download from this website. The first detail is from the calendar which shows what part of which plant can be harvested during any particular month. The calendar is a rough guide and based on the mild western UK climate. Also, no two years are identical. The parts, from roots to seeds, are colour-coded in an intuitive way (e.g leaves are green), which allows for quick scanning and a compact guide. When a particular part is at its best, a horizontal bar shows when that is the case. In the calendar the code extends to whether a part is edible or only useful in another way, by using a dot or square. The calendar contains all the plants which are featured in greater detail in the illustrated plant directory (about 50 plants). The second image from the guide is a detail from the plant list, which gives basic details of edibility of over 300 wild or naturalised plants (colour-coded as before), together with basic information on preparation and number codes of essential safety notes. For more details on the guide, click the above link.